Starting your own firm comes with a lot of decisions, from how you will handle compliance issues to how to design your website. The list goes on and on. One of the most important questions we hear is, "How will I find my first clients?" 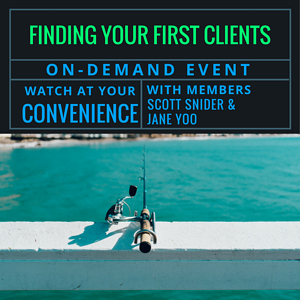 XYPN members Scott Snider and Jane Yoo answer this question in our next free webinar. Join us to hear how they secured their first clients, and for tips and tricks on how to build a client base of your own. This call is ideal for anyone considering membership with XY Planning Network. What forms of marketing have you found to be the most useful for you while growing your firm? In each of your practices, what "deliverables" (on your website or physical paper or via email) did you use when engaging with prospects? Do you have a benchmark to meet as to how many prospects you need to meet in a given month or year? Where are you finding leads, what do you do to get in front of your audience, and what is your success rate? Did you find joining networking groups or getting involved in an organization helpful in building your business? Jane Yoo, CFP®, MBA, is the founder and CEO of Jane Financial. She started her business to help put Gen X women and their families on the path to financial freedom. As a CERTIFIED FINANCIAL PLANNER®, Jane believes in an open, collaborative, and non-judgmental approach to: (1) discovering your goals and dreams, and (2) creating a financial plan customized to YOU. After witnessing the stressful effect the dot-com market crash had on home life as a kid, Scott Snider, CFP®, CRPC®, knew there was a place for him in the financial services industry. Since completing his BS in Finance at Miami University in 2006, Scott has been giving sound financial advice to clients through his firm, Mellen Money Management, a fee-only advisory firm that specializes in student loan and college affordability advice.